Well, you know how it is. One recipe flops (a batter that never is a dough, long story) and you run out of non-stick spray that you need before you can bake that cake - well, you did buy that bag of pumpkin spice marshmallows. So here's some real-life, this is all I baked this weekend, completely processed food product "baked good." Sometimes that will have to do! 1. Line a 13x9-inch pan with foil, with ends of foil extending over sides. Spray with cooking spray. 2. Microwave butter in large microwaveable bowl on HIGH 45 sec. or until melted. Add marshmallows; toss to coat. Microwave 1-1 1/2 minutes or until marshmallows are completely melted and mixture is well blended, stirring after 45 seconds. Add cereal; mix well. 3. Press onto bottom of prepared pan. Decorate with candy corn; cool. 4. Use foil handles to lift cereal mixture from pan; cut into shapes with pumpkin shaped cookie cutters or use knife to cut into bars. 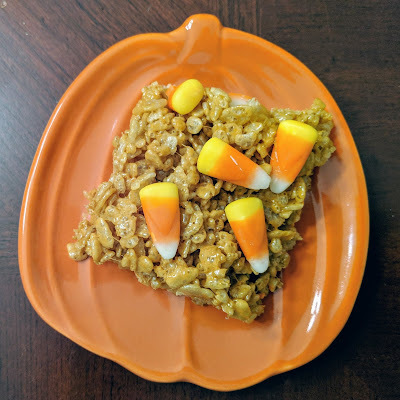 I saw many variations of this online, including several that incorporated coffee/espresso in some way in order to make pumpkin spice latte rice krispie treats. This might be tasty! I also saw some combined with marshmallow cream in the middle, others dipped in dark or white chocolate, others making pumpkin spice from plain marshmallows. You do you. The contained that goes in the microwave needs to be larger than 4 cups, I learned through experience and a very sticky mess. I found I needed less space than 9x13 so I put my empty nonstick spray can down in the 9x13 pan and pushed all the marshmallow mixture into the smaller space for more even, thick squares.